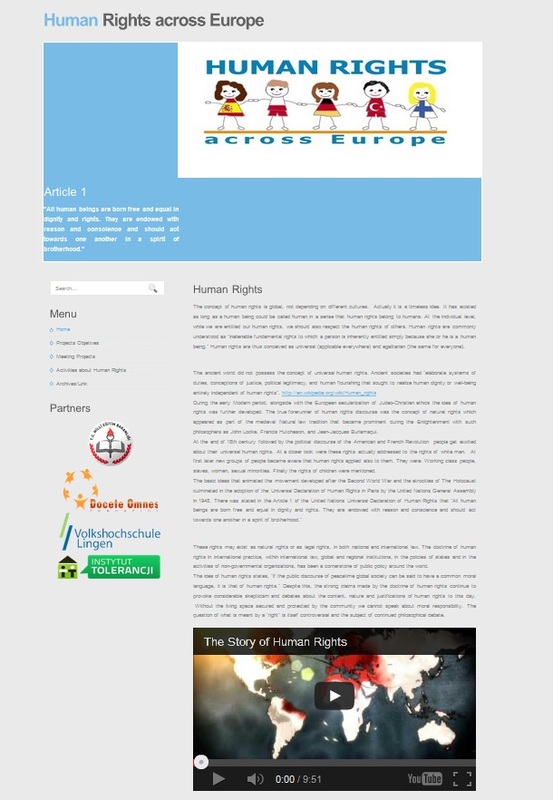 Human Rights Across Europe project aims to raise awareness on human rights. Therefore the project is a raising awareness project of adults. The main target group will consist of general public including representatives of NGOs, teachers, psychologists etc.. our main task is to prepare an e-learning platform on fundamental human rights. This partnership offers exchange of experiences and knowledge between the organizations who have trainings on human rights. We want to rise the awareness of the society on human rights. The main result of the project will be an e-learning platform on human rights. Human rights are commonly understood as "inalienable fundamental rights to which a person is inherently entitled simply because she or he is a human being." Human rights are thus conceived as universal (applicable everywhere) and egalitarian (the same for everyone). These rights may exist as natural rights or as legal rights, in both national and international law. The doctrine of human rights in international practice, within international law, global and regional institutions, in the policies of states and in the activities of non-governmental organizations, has been a cornerstone of public policy around the world. The idea of human rights states, "if the public discourse of peacetime global society can be said to have a common moral language, it is that of human rights." Despite this, the strong claims made by the doctrine of human rights continue to provoke considerable skepticism and debates about the content, nature and justifications of human rights to this day. Indeed, the question of what is meant by a "right" is itself controversial and the subject of continued philosophical debate.